I was in Pristhina as the Vice President of EBAN on the 30th of October to give a keynote speech on entrepreneurship and open innovation for the ICT community in Kosovo. 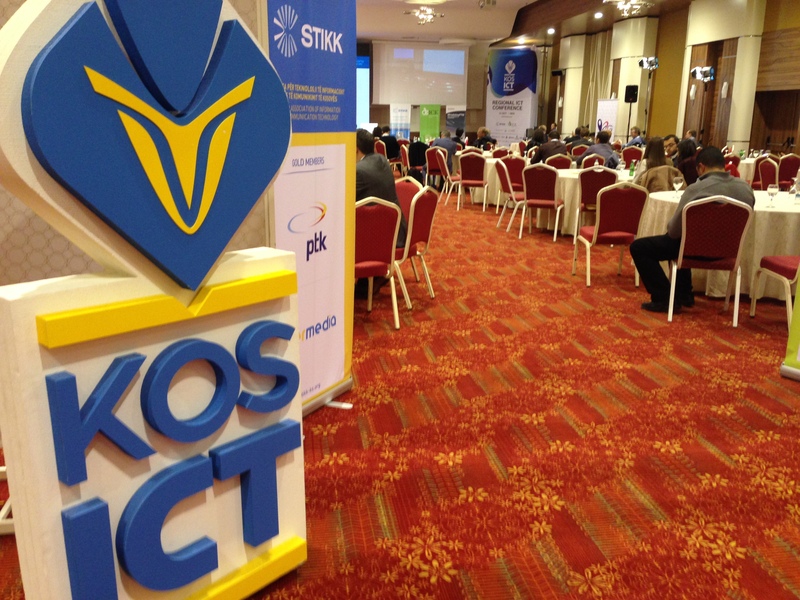 The ICT community, start-ups, angel investors, policymakers and academicians all came together for KosICT, one of the top ICT event in South East Europe, organised by The Kosovo Association of Information and Communication Technology (STIKK) and Innovation Center Kosovo (ICK). I was invited to contribute to this event by STIIK, ICK, Universum College and KosBAN. 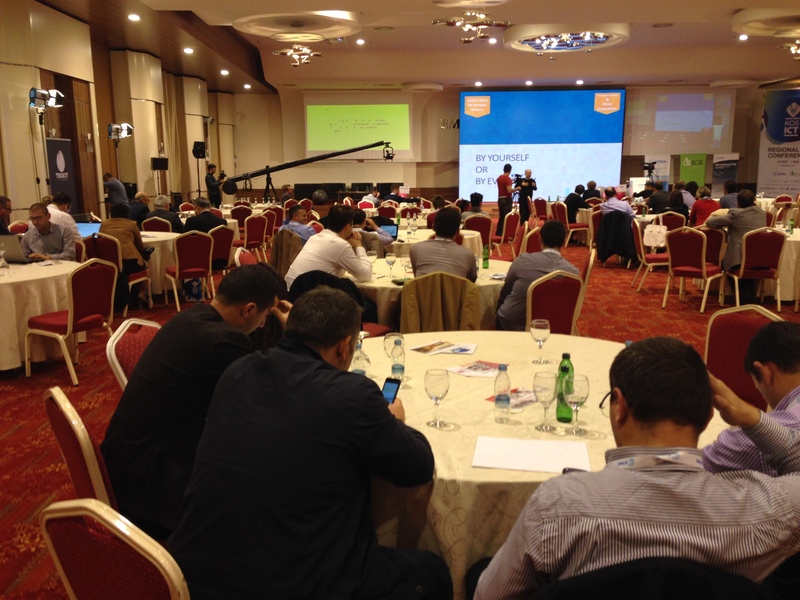 More than 250 members of the start-up ecosystem of the SEE – South East Europe attended this 3-day event. 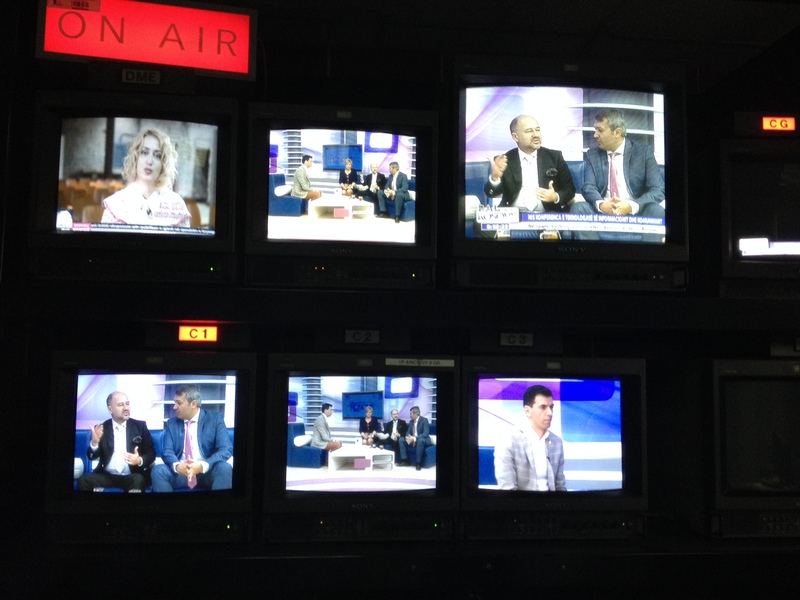 I was also interviewed by RTK, Radio Television of Kosova, KLAN TV Kosovo and Radio RTK. Additionally, I met with more than 100 university students for a tea & talk session at the Universum University College. The most important output of KosICT for the European entrepreneurship ecosystem was the official announcement of the launch of KOSBAN – the Kosovo Business Angels Network. Kosovo was the poorest part of the former Socialist Federal Republic of Yugoslavia (SFRY), and in the 1990s its economy suffered from the combined results of political upheaval, the Yugoslav wars, Serbian dismissal of Kosovo employees, and international sanctions on Serbia, of which it was then part. After 1999, it had an economic boom as a result of post-war reconstruction and foreign assistance. In the period from 2003 to 2011, despite declining foreign assistance, growth of GDP averaged over 5% a year. This was despite the global financial crisis of 2009 and the subsequent Eurozone crisis. Inflation was low. Most economic development since 1999 has taken place in the trade, retail and construction sectors. The private sector which has emerged since 1999 is mainly small-scale. The industrial sector remains weak. The economy, and its sources of growth, are therefore geared far more to demand than production, as shown by the current account, which was in 2011 in deficit by about 20% of GDP. Consequently, Kosovo is highly dependent on remittances from the diaspora (the majority of these from Germany and Switzerland), FDI (of which a high proportion also comes from the diaspora), and other capital inflows. In 2009 the industry sector accounted for 22.60 of GDP and a general workforce of 800,000 employees. It’s in the 150th place compared to the rest of the world. There are numerous reasons for this kind of stagnation, ranging from consecutive occupations, political turmoil and the recent war in Kosovo (1999). The electricity sector of Kosovo relies on coal-fired power plants (97%) and is considered one of the sectors with the greatest potential for development. The inherited issues after the war in Kosovo and the transition period have had an immense effect on the progress of this sector. Regulation of activities in the energy sector in Kosovo is the responsibility of the Energy Regulatory Office (ZRrE). An additional factor in the energy sector in Kosovo is the Ministry of Economic Development (MZHE), which has the responsibility for dealing with issues that have to do with energy. MZHE prepares legislation and drafts strategies and projects. Kosovo has large reserves of lead, zinc, silver, nickel, cobalt, copper, iron and bauxite. There is also believed to be around 14,000 billion tonnes of lignite. In 2005 the Directorate for Mines and Minerals and the World Bank estimated that Kosovo had €13.5 billion worth of minerals. The number of registered businesses in Pristhina is currently at 8,725, with a total of 75,089 employees. The exact number of businesses is unknown because not all are registered. Since independence, the Mayor of Pristina, Isa Mustafa, has built many new roads in Pristina. Also he has plans to construct a ring road around the city. The national government is taking part in modernising the roadways as well, building motorways to Ferizaj and other cities. An Albanian millionaire in Croatia is building the largest building in the Balkans with a projected height of up to 262 metres (860 ft.) and capacity to hold 20,000 people. The cost for this is 400 million Euros. The Lakriste area is designated by the Municipality as a high-rise area with many building complexes. The buildings such as ENK, World Trade Centre, Hysi and AXIS towers are being constructed in an area which previously served as an industrial zone. Turkey’s Limak Holding and the French firm Aéroport de Lyon won the concession tender for the Pristina International Airport. Two companies pledged investment of 140 million euros by 2012. Way before its declaration of independence in 2008, Kosovo and in particular its capital Pristina have been a big commerce center in the Balkans with a GDP of 4.0% in 2009. Pristina has a variety of commercial centers. The best-known commercial centres include Albi Mall, Migros, ELKOS – ETC, Viva Fresh Store, Maxi and Grandstore. Kosovo’s economic activities are being supervised and supported by local and international chambers of commerce. Innovation Centre Kosovo (ICK) is a center whose aim is to connect the research and development component of scientific fields with the business sector, focusing on creating new job opportunities oriented towards the future, based on knowledge and new technology. ICK was founded to support entrepreneurship, innovation and commercially-based business development, with a focus on information and communication technology. The centre supports both start-ups and existing companies with the potential for growth. ICK will both create new jobs through the businesses that supports and train young people for jobs in the broader marketplace. ICK will be a hub for connecting new ideas and technology with human and financial resources to create or expand commercially viable companies that can successfully fill the needs in the market, generating sales, trade, local productive capacity and skilled employment. It offers incubator services, mentoring, consulting and training to entrepreneurs and managers in business planning, accounting, finance, product/service development, marketing/ sales, human resources, technology development and transfer and matchmaking with local, regional and international businesses. Athene Prosjektledelse, Norway and the Kosovo Association of Information and Communication Technology (STIKK), Kosovo are the founders of ICK, and Crimson Kosovo is the main cooperating partner. ICK is funded by The Norwegian Ministry of Foreign Affairs. To learn about personal backgrounds, visit http://ickosovo.com/about/ and click on the names. STIKK, The Kosovo ICT Association, was established in 2008 by the six founding member companies and supported by the Norwegian Ministry of Foreign Affairs, Crimson Capital and IKT Norge, with the aim of acting as a collective voice of the ICT sector. During the first five years of its operations STIKK was able to achieve numerous successes and become one of the leading drivers of the ICT industry and ICT community in Kosovo. Striving towards the development of the ICT industry, STIKK implemented numerous projects aimed to promote the ICT sector of Kosovo, improve its regulatory framework, implement research and industry specific analysis, and facilitate professional development of sector’s constituents. STIKK currently accounts for 125+ members, which represents 90% of the whole ICT market of Kosovo. STIKK is dedicated to contributing to the long-term-growth of the information and communications technology industry in Kosovo and is committed to improving the business environment for ICT, as well as to promoting the contribution of the information and communications technology to economic growth and social progress in Kosovo. STIKK seeks to participate in the development and implementation of policies by helping the government and institutions of Kosovo to understand current and future technology trends, and how technology can contribute to the economic growth of the country. 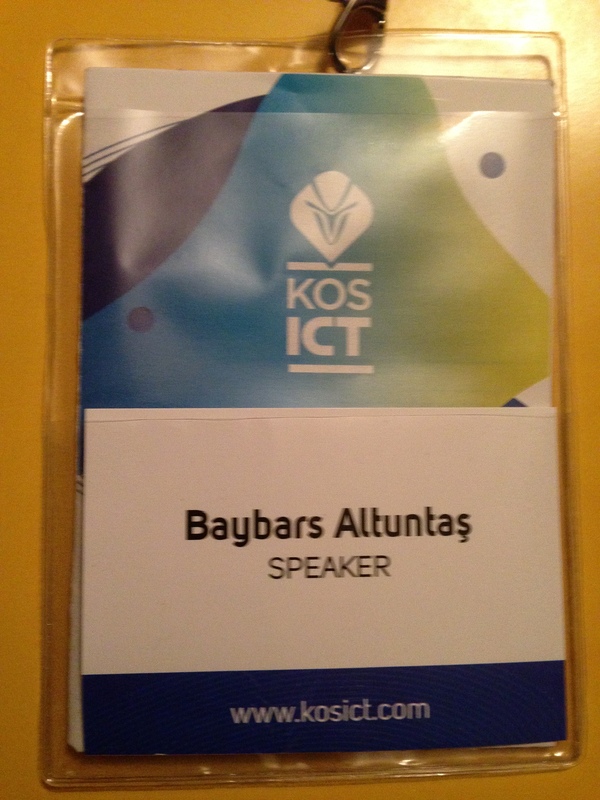 KosICT is a regional conference in information and communications technology, which each year intends to cover the global trending topics of ICT by gathering international, regional and local speakers. This year, KosICT ’14 is bigger and it includes 2 parallel sessions, 8+ speakers, 8+ panelists and 4+ developer sessions. Additionally, KosICT ’14 features the #PrishtinaFTW event and a trilateral business-to-business meeting with more than 10 companies from Norway and Germany. 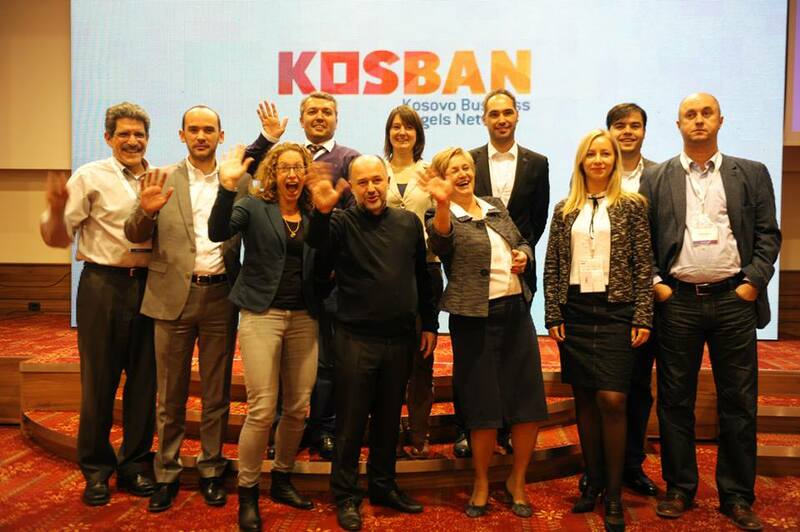 KOSBAN is Kosovo’s Business Angel Network to support start-ups and the global voice of Kosovo entrepreneurs. KOSBAN has three main goals: investing in start-ups, training entrepreneurs, and training business angels. It is an initiative of Alejtin Berisha in cooperation with a group of angel investors. KOSBAN was a partner of KosICT2014. I arrived at the Pristina airport in the evening. Alejtin Berisha, the leader of KOSBAN, the Kosovo Business Angels Network and president of Universum University College, collected me from the airport. He wanted me to be involved in the KosICT2014 programme. I met with Alejtin last year in a start-up event in Istanbul, where we had a meeting to discuss how angel investment systems foster economic development and start-up ecosystems. He worked extremely efficiently and promoted the system in Kosovo in a very short period of time. In this year’s KosICT, he wanted to introduce founders of KOSBAN and hold a workshop to proceed with the founding procedures of the network. It was a half-hour drive from the airport to the Emerald Hotel, where I would stay for KosICT, as it was also the venue for that event. The hotel’s spa center is fine. At breakfast, the breads were extremely delicious and different. The hotel has also a very good service and the staff are fine. But would I stay in the same hotel again? No. Because there is an even better hotel which has a better location for people who enjoy living in the city. This is the Swiss Diamond Hotel, located in the very center of the downtown area. I personally enjoy interacting with the city as soon as I step out of a hotel. My room overlooked a meadow. The weather was a bit wintery, so my decision to take coats with me was a good one. When I arrived at the hotel, I was welcomed with a surprise. The embassy of Turkey had a reception at the Emerald Hotel to celebrate the 91st anniversary of the founding of the Republic of Turkey. I immediately went up to my room, changed into a suit and came down to the reception hall. This would be my first celebration of Republic Day outside of Turkey. I asked the waiter to point out the ambassador because I had just arrived and knew nobody there. 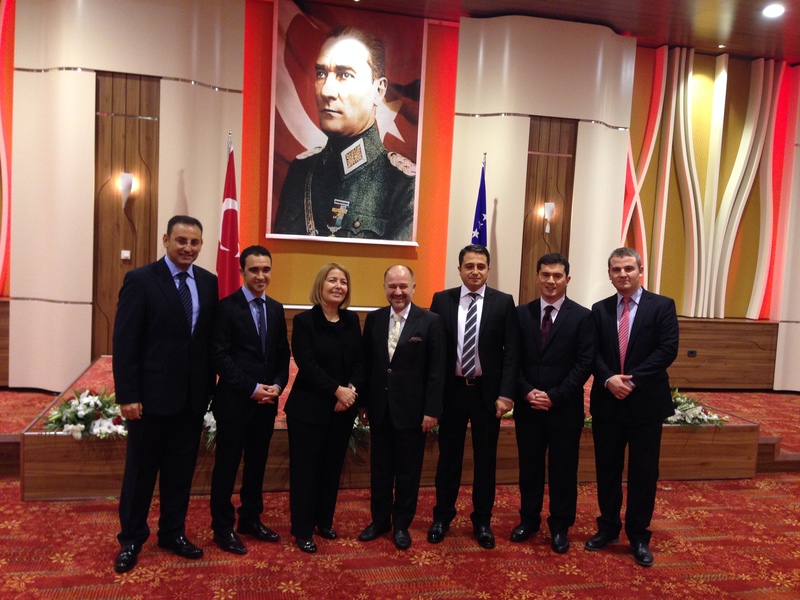 The ambassador of Turkey to Kosovo is a woman. What is interesting in Kosovo is that most of the ambassadors are women. The US ambassador, the German ambassador, and the Turkish ambassador are all women. I was honoured that our ambassador showed a special interest and introduced me to all the embassy staff. After congratulating everyone on the holiday, I went up my room to rest a bit. Alejtin picked me up at 8 a.m. to go to the RTK Channel for a live broadcast. RTK (Radio Television Kosovo) is the official broadcasting company of Kosovo. The 30-minute live interview was immensely enjoyable. Resime Grainca welcomed us with her charming Turkish. Aledjin Berisha, Vjollica Çavolli, the Executive Director of STIKK and I were being interviewed. Ms Çavolli is a wonderful person, speaking perfect Turkish and has a great world vision in all aspects of life. Following the interview we returned to the hotel for the opening ceremony of the KosICT event. As I entered the hotel’s conference center, I chatted with Michael Gold, a very affable person and investor in Kosovo and Macedonia. Then we listened to the speakers of the forum. My speech on entrepreneurship and innovation was at 3 p.m.
Open innovation is a term promoted by Henry Chesbrough, adjunct professor and faculty director of the Center for Open Innovation at the Haas School of Business at the University of California,in a book of the same name, though the idea and discussion about some consequences (especially the interfirm cooperation in R&D) date as far back as the 1960s. Some instances of open innovation are Open collaboration, a pattern of collaboration, innovation, and production. The concept is also related to user innovation, cumulative innovation, know-how trading, mass innovation and distributed innovation. “Open innovation is a paradigm that assumes that firms can and should use external ideas as well as internal ideas, and internal and external paths to market, as the firms look to advance their technology”. Alternatively, it is “innovating with partners by sharing risk and sharing reward. The boundaries between a firm and its environment have become more permeable; innovations can easily transfer inward and outward. 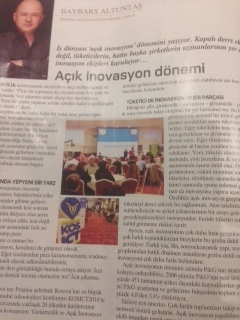 Here is the link where you can access my weekly article in Para of Turkey on Open Innovation and my observations on KosICT2014. Alejtin collected me from the hotel at 7a.m. because we had to be ready for The Morning Show of KLAN TV of Kosovo. 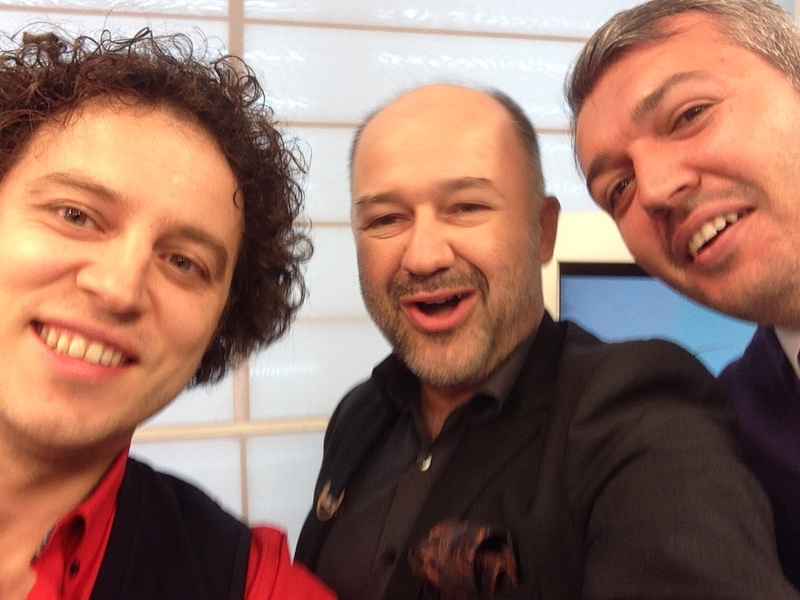 The Morning Show was very enjoyable and we made a live-selfie during the programme. 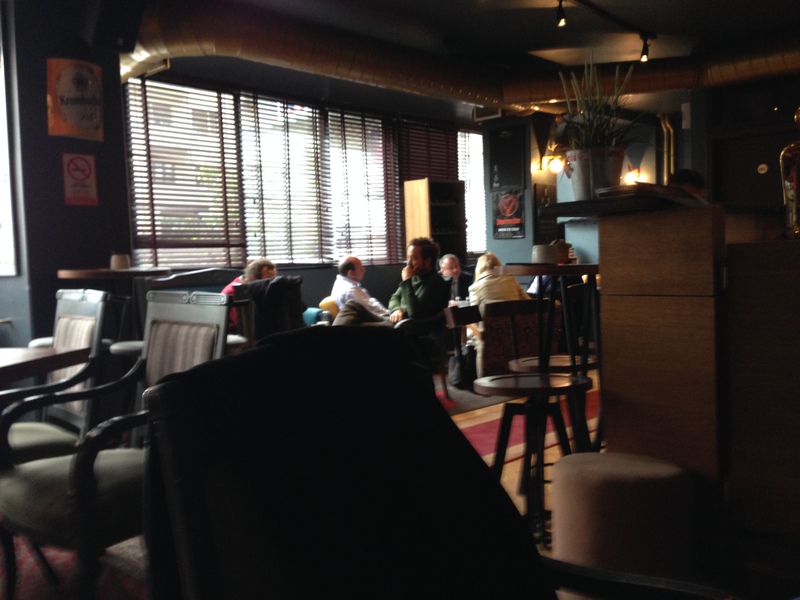 After appearing on the Morning Show of Klan TV, we went to a very nice coffee shop. This coffee shop has a different atmosphere, with different styles of armchairs, Turkish carpets, and modern colours on the walls. I have no idea about the future plans of the entrepreneur running this business, but if I were him I would expand this unique shop design by franchising. After we had our coffees, we went to Universum University College for a tea & talk planned for 10.30. Over 100 participants were in the room and we spent a very enjoyable 3 hours there. There were even participants in the room from Albania, who brought along their copies of my book for me to autograph and I enjoyed answering their questions. Here is some news about my tea & talk at Universum College. 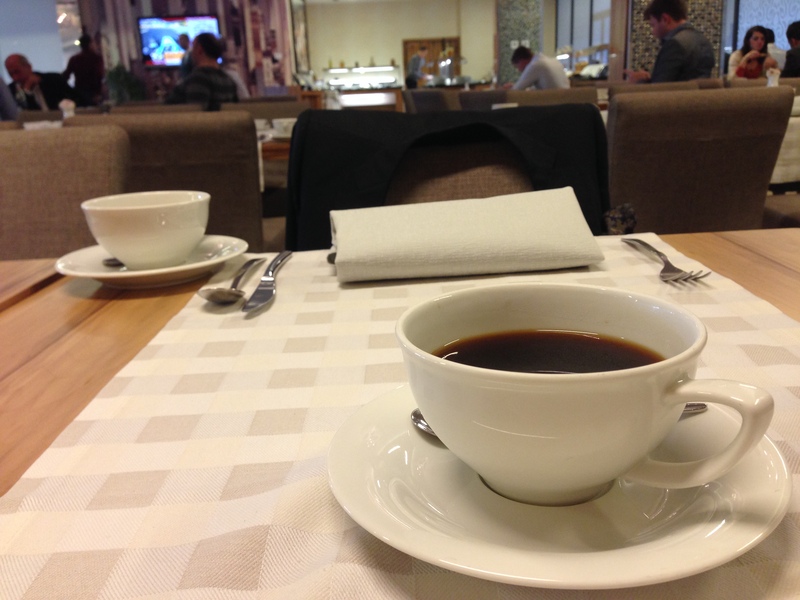 After the conference at Universum College, we went back to the hotel for the KosICT. I was scheduled for a panel at 2 p.m. about the business angels network in the entrepreneurship ecosystem. 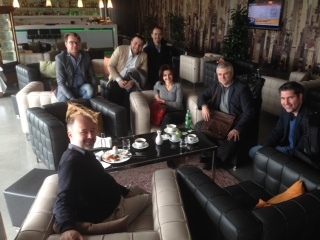 We discussed the contributions of KOSBAN to the development of the start-up ecosystem in Kosovo. I showed a video of EBAN named 7 wrong things you know about angel investors. We held the first official meeting of KOSBAN at 6 p.m. in the conference hall after everybody else had left. In this official meeting we discussed how KOSBAN could accelerate the economic system of Kosovo. It was a great pleasure for me to answer all the questions raised by the KOSBAN founders. The emblem and logo of KOSBAN was also approved by this founding members group. It was decided to open KOSBAN’s website by the middle of November 2014 and then complete the full process for EBAN membership. 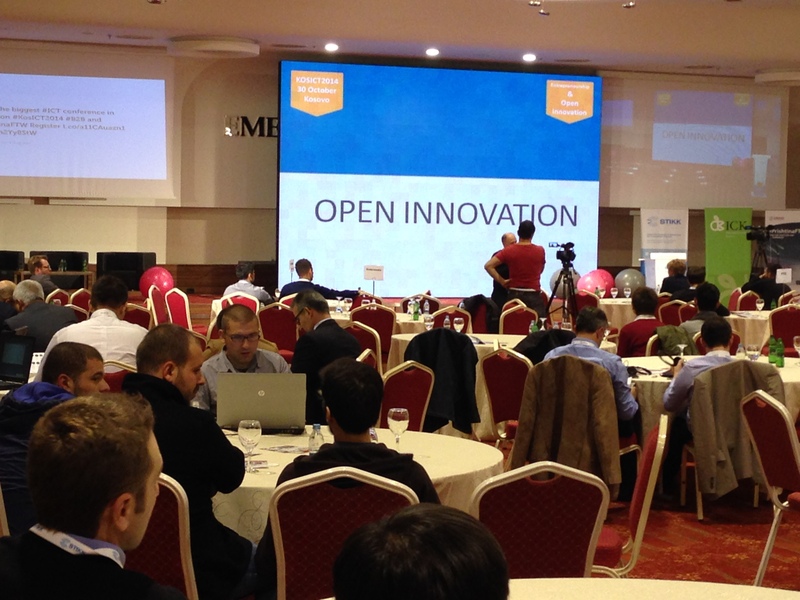 The third day of KosICT2014 was in the Kosovo Innovation Center. Alejtin collected me from the hotel at 10.30 a.m. and we were ready to listen to the pitchings of start-ups at the innovation center at 11.00. During the coffee break I was invited to visit the Cactus Training Center of the Cactus Group by Driton Hapciu. The center was just a few metres away from the innovation center. 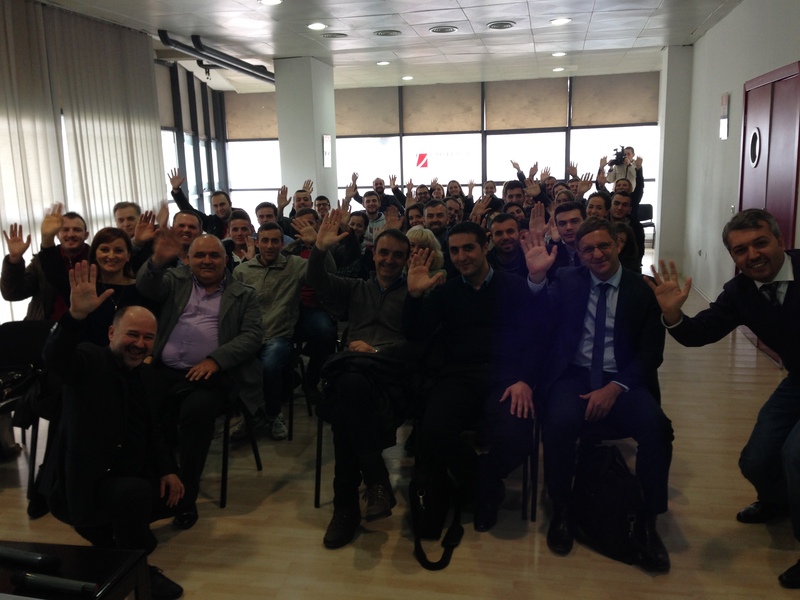 I had the opportunity to understand the IT courses market of Kosovo in this visit. Vjollica Çavolli, the Executive Director of STIKK, accompanied me on my visit to every floor of the innovation center. To be honest, the incubation center of the Kosovo Innovation Center was better than I expected: very well designed and equipped to meet the needs of entrepreneurs. 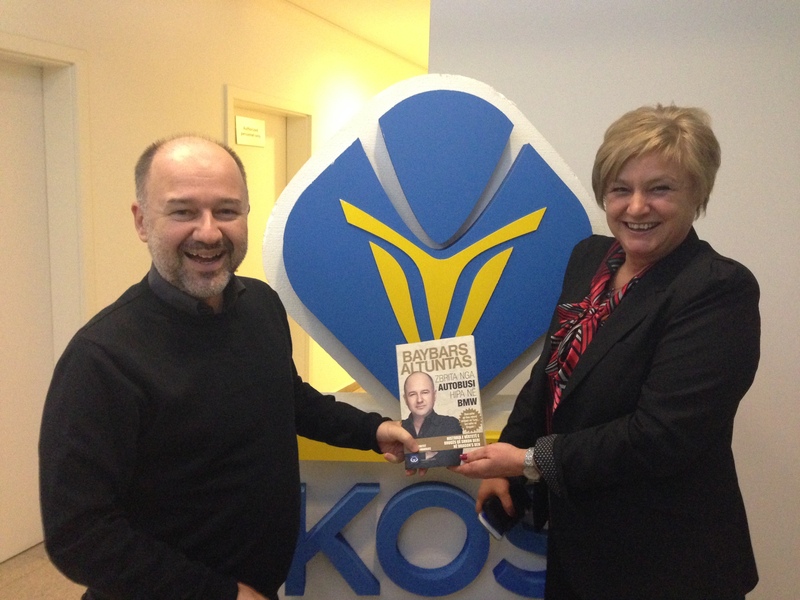 She came to the center with an Albanian version of my book and I autographed it with pleasure. She had bought it at the bookstore earlier that morning – it was the last one in stock. Uranik Begu is the Executive Director of ICK – Innovation Center Kosovo – and he is a very friendly person with a solid background. He lived in the USA for many years and is now leading the innovation of Kosovo with his wonderful team. His wife is a dentist who graduated from Karolinska University in Stockholm. Karolinska University is the university where Alfred Nobel graduated from. So, the Nobel Prize ceremonies are in Stockholm’s city hall every year (see my observations about the Stockholm entrepreneurship ecosystem in my blog on Stockholm). Then Alejtin took me to the hotel at 3 p.m. and was free until 5.30, so this was my opportunity to go through my emails. 17:00 FIRESIDE CHAT – What does an accelerator do for a start-up? Alejtin took me to the closing party of KosICT at 5.30 and we were one of the first people to arrive. Because Alejtin’s friend had a wedding ceremony to attend, he couldn’t join the party. I had a lovely time and didn’t leave until 1 a.m.
At the party I was introduced to Ms Irena N. Chaushevska by Villu Arak, advisor to the former president of the Estonian Stock Exchange Market.In this intensive meeting I took the opportunity to learn more about the Macedonian start-up ecosystem. Villu also contributed to KosICT2014 with useful comments and leadership skills in the panels and in the flow of the programme. He is also a genuinely friendly and experienced entrepreneur and I thoroughly appreciated his comments in the forums. Ms Chaushevska is an entrepreneur who set up the biggest and most professional accelerator center in Skopje, Macedonia. She invited me to Skopje to give a speech for the Smart-up Summit they were hosting on the 3rd of November. Because my programme had been arranged and I was scheduled to fly back to Istanbul on Sunday evening, I couldn’t confirm my participation immediately. But after a long chat about Macedonia’s entrepreneurship ecosystem, I felt that I had to participate the event hosted by NewMan’s Business Accelerator. For the first time in my life, I would go from one country into another in a car and experience border procedures. For the first time in my life, I would visit two different cities so close to each other (90 minutes driving time) but in two different countries. 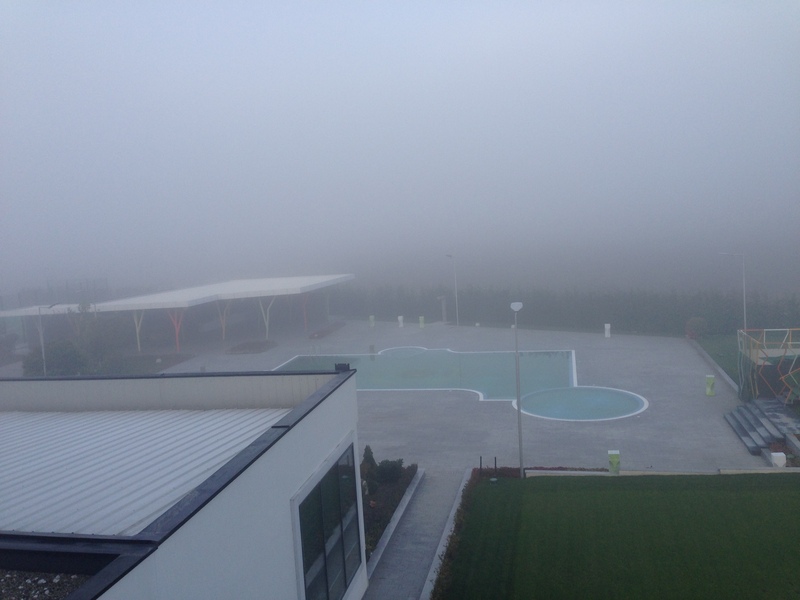 As you will have understood from the picture, it was a lovely Sunday morning at the hotel. Because of the beautiful weather, families were out in the streets with their children. After this photo was taken everybody left to return to their home countries to reach out to new entrepreneurs. After breakfast ended, Alejtin took me to chat with Prof Dukagjin Gorani at a coffee house about the angel investment and entrepreneurship. After our coffee break we went to a nice restaurant and discussed until 3.30 the Ottoman policies and President Erdogan’s policies. Because I am not particularly interested in politics, I preferred listening to the Professor Gorani. He was the political advisor to the former Prime Minister of Kosovo. He touched on interesting points with different perspectives. It was a very enjoyable chat. 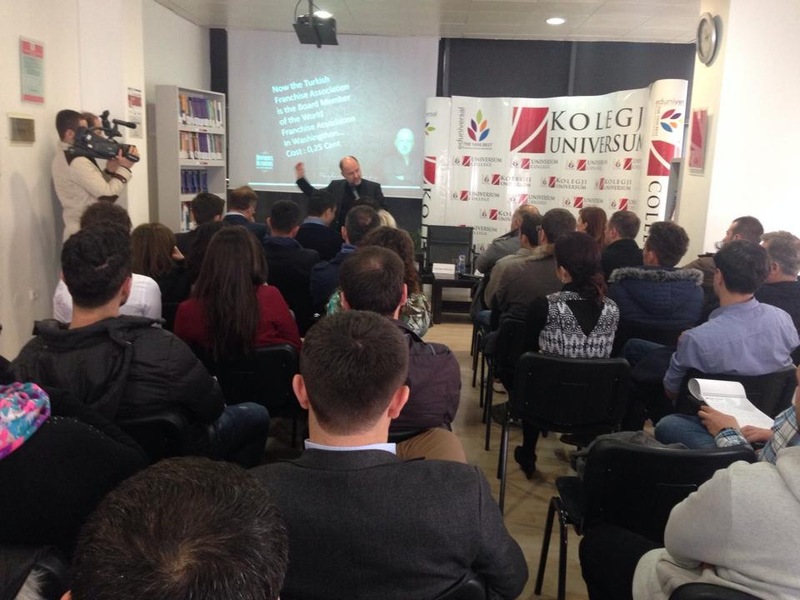 If I visit Kosovo again, I would welcome the opportunity to spend more time with the Professor Gorani. While our debates were going on, my secretary was trying to arrange my trip to Macedonia. Ivica Penic of the NewMan’s BA sent a taxi to pick me up from the hotel and I left the Emerald Hotel at 4.30 p.m. The rest of the story is coming soon . . .
Edlira Kasaj, CEO of Protik, ICT Resource Center of Albania, will now try to set up ABAN – Albanian Business Angels Network, in Tirana. Toby Stone is a great contributor to the ecosystem. His comments about the pitchings were amazing. I loved the name of Mentor Sahiti. He is indeed a born mentor. Tamer Topaloglu from the Turkish Embassy has just moved to Pristina and he is a fan of mine from Turkey. Hekuran Dali, who graduated from the same university I did, has a very interesting business idea. I am interested in investing in him. Naim Dedushaj is the director of Diaspora Investment. Kosovo has a serious amount of capital abroad. Filip Stojanovic from Bulgaria is a very enjoyable person. He is the USAID contractor in Sofia. Nora Haxhiu speaks Turkish very well. She will contribute to the entrepreneurship ecosystem under the KOSBAN umbrella.